I’ve been a member of CAAT for quite a few years, and of CND – on and off – most of my life. My dad was a conscientious objector after the war and always my hero and inspiration. I’d been involved in a few peaceful actions including one in Parliament Square and Portcullis House with a banner that read Stop Arming Saudi just before the second and very close vote in the Commons. But again and again I only discovered the dates of the Arms Fair, which happens at the ExCel in Docklands every two years, too late. I always had a busy diary to prevent me playing a part. So this January, when I found out the week when all the machinery of war is brought into the showrooms, I blocked it out. I then attended four planning days/weekends at Friends House in Euston where my commitment was sealed and I met some thrillingly well-informed and committed people, most of them young. I was a little nervous on Tuesday 5th September because I’d never done the rather long and complicated train journey before and I was on my own. But when I arrived, I soon saw where to go: past the camp on the grass to the road at the East Gate. Some of the banners I’ve seen this week have been works of art, some witty and some simple but passionate. Creativity struck me as a key element of the protest, along with good humour, friendliness and patience. But most remarkable was the ingenuity that enabled people to outwit the police, in spite of a massive presence which grew day by day. No Faith in War was the theme on Tuesday and Quakers were everywhere. By that I mean abseiling from the bridge (four arrests) and blocking the road in other ways by locking on and standing or sitting in the middle. I knew about locking on but I’d never seen it live and within reach before. Brave people put an arm through a metal tube and then perhaps through a suitcase or other object stuffed solid with materials which will challenge the police cutting crew. This means being on the ground for a minimum of two hours and sometimes four, and half of that time can be taken up by the process of removal – i.e. slicing through with power tools while the cutters and the person on the ground wear masks. The men in black were an intimidating crew and obliged to surround the protesters in a way that really was up close and personal. Legal observers are trained to listen, observe and make notes and I saw food and drink passed to protesters as well as cushions. 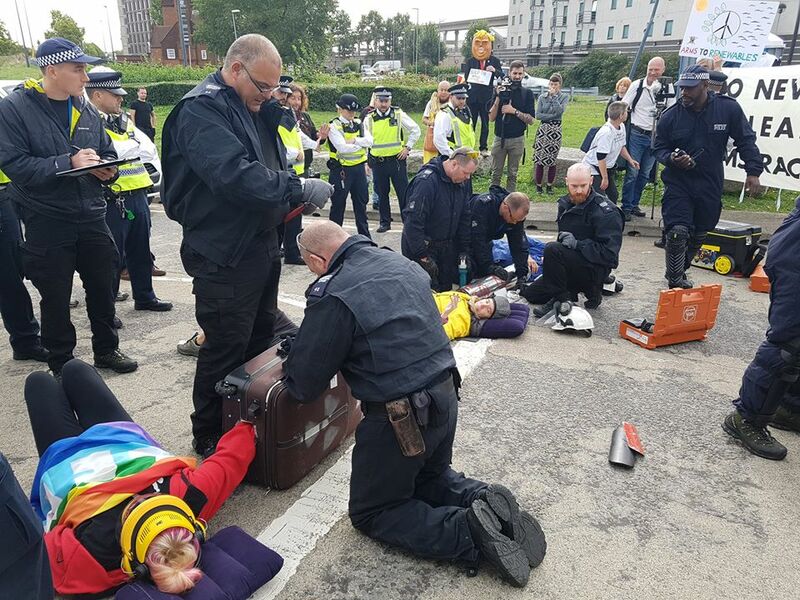 The Quakers arrested for refusing to move from the road were mostly retired and in some cases elderly people unable to be there without a seat. Their prayerful stillness was very moving, as was the Quaker Meeting in the road for some 200 people. That was followed by an Anglican Communion service and priests placed a line of Bibles across the road, with grapes in between. There was Buddhist chanting too, and I saw groups from other faiths. I spent almost all my day at the East Gate but walked the length of the ExCel building (two DLR stops) with the rest of the cast of a short play I’d written – The Terrible Marriage of Britannia and Death – in order to perform it for the third time. 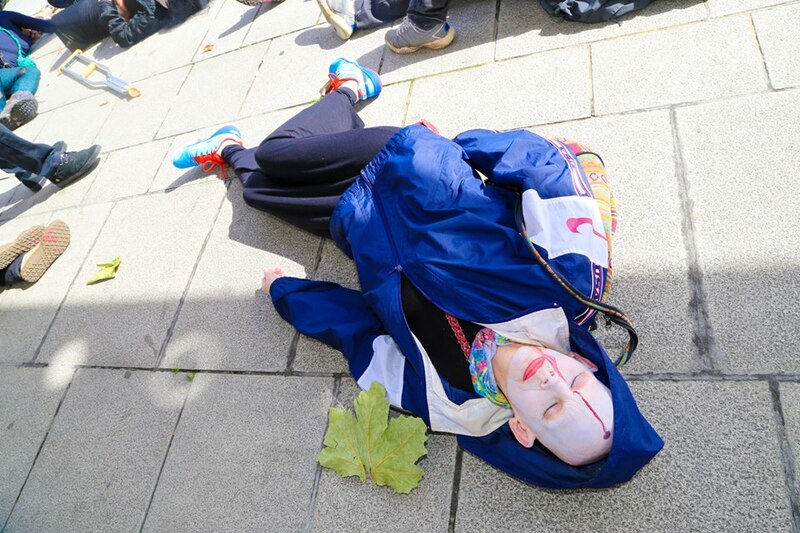 I was Britannia in a Union Jack wig and zombie bride dress plus red glitter trident, but the Arms Fair – revealed as the Grim Reaper with hood and scythe – was the star of the show, along with Jesus played by a woman. We’d met at nine at the nearby Garden Café, which supports the protest, in order to practise, but weren’t sufficiently complete to do so, which meant that our first performance to the crowd was a little under-rehearsed. But it was huge fun and we bonded. I think it illustrates the odd mix of playfulness, creative effort, camaraderie and deeply serious commitment that characterises the whole protest. The day itself was the quietest of the four I spent, and the most middle-class. 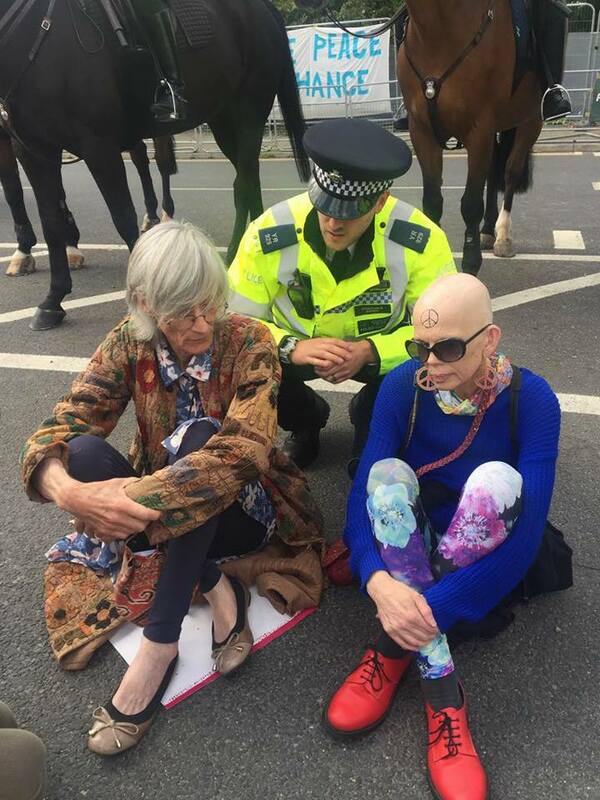 I wondered why I hadn’t seen Quaker Jo, who had coordinated planning, until I found that she’d locked on and been arrested early. Every arrest I saw was greeted with cheers, whoops and resounding applause. Wednesday’s focus was Arms to Renewables so there were lots of Green Party groups present, three large wind turbines and many small ones made by individuals before or during the day. Events like this workshop were organised by Green Party member Mariette Labelle, and included holding beautiful gauzy waves which stretched across the road. We all swirled and jiggled around while the police warned us to move. At one – given the role by Mariette because I’d issued the invitation – I met Jonathan Bartley, co-leader of the Green Party, with his assistant Russell at Prince Regent. I then introduced him to the crowd before he delivered a powerful speech. He turned out to be what I’d expected – a thoroughly nice, warm, natural and friendly human. He began a Facebook Live after that, asking me to show him around – which I was in the process of doing when a lorry came and we all ran into the road with banners and the waves. By the time the police had persuaded us to clear the road, word travelled back through the crowd that there was a lock-on at the other end. We’d been an effective if unknowing decoy and Jonathan must have been delighted with his footage. 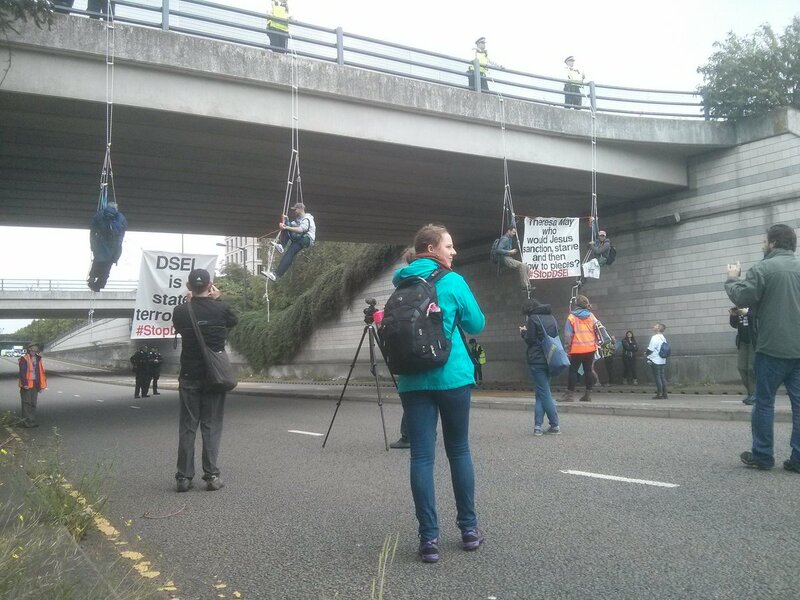 Arrests were up to 57 by the end of the day – every one of them for ostructing the road, which was of course the goal. On Thursday we called for free movement of people not weapons, with a theme of welcoming refugees and solidarity with LGBTQ humans, some of whom become refugees fleeing in fear of their lives. Things began quietly – if vey colourfully. The police presence was so substantially increased (after we’d run rings round them the day before) that I simply couldn’t see how anyone would pull off a lock-on. But Veterans for Peace held the road a while, asking the police to check for illegal weapons on the vehicles coming through. I danced on the island to Motown, chatted and took part in improvised creativity with a stretch of knitting produced on enormous missiles for needles (which became a border to cross and a web to connect us all). 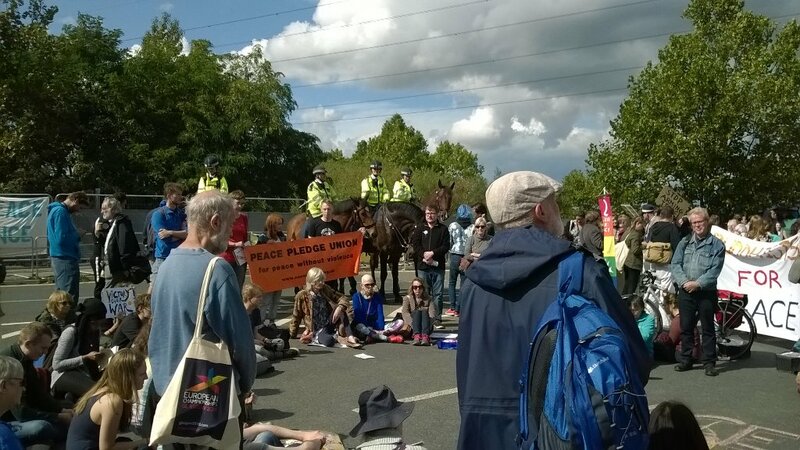 Somehow a picnic was produced to block the road: vegan chilli, rice, salad and tea for a huge crowd sitting chatting while the police looked on helplessly and warned from time to time that they’d allow us five more minutes. I think we held the road for a least half an hour. Then, on the mound by the campsite, I watched a moving play by African women who were asylum seekers, after which Q and A had just begun when we heard the noise that has only one meaning in this context: a lock-on. Don’t ask me how. We all partied behind the heroes and by the time I left, both gates were blocked. But I witnessed my first glimpse of police misbehaviour when a cushion was yanked roughly from one head on the ground. Sunday was another day off for me but the policing at Stop Arming Turkey reportedly became more aggressive. There was Kurdish dancing in the road, which saw few trucks coming in and was blocked some of the day. Otherwise there were workshops and speakers as well as live music, and I saw a Tweet from celebrated Quaker activist Sam Walton saying that he’d heard the exhibition was four days behind…? 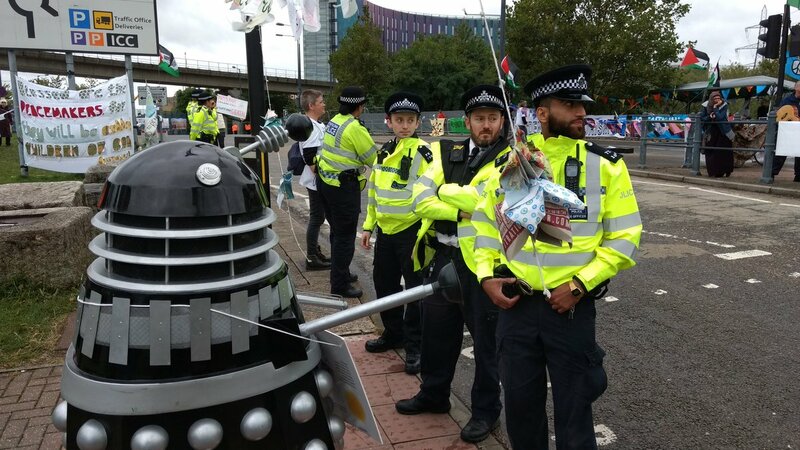 Monday was the day The Guardian finally reported the protest with a headline that more than a hundred had been arrested, quotes from some of those heroes and from Caroline Lucas and Jeremy Corbyn. It was also the morning I took part in a die-in outside the ExCel building which is hosting the world’s biggest Arms Fair. Here I am at the Garden Café where forty-something protesters of all ages gathered to be face-painted. In spite of a singalong to classics like All Along the Watchtower, some exuberant jazz piano and the camaraderie as we ate, drank and prepared – watched by three vans of police – smiles for the camera were not appropriate. Three of us dressed rather differently, in suits, heels and lanyards that read BAE, London Arms Fair. It was their job, when we reached our destination (followed by police) to step over us when we died. Lying for twenty-five minutes on the ground pretending to be victim of war was a memorable experience and one I’m glad to have undertaken. During this time I overheard a conversation between a young activist, watching with her small child, and an elderly man originally from India. She explained and asked what he thought. He approved. “It addresses the heart,” he said. I was close to tears. They shared a lot more, including some of his life story, but I didn’t hear it all. “I’m glad I met you,” he told her as the action ended. “I’m glad I met you,” she replied. That evening, after I had gone home, there was a candlelit vigil for peace and those killed or maimed by the kind of weapons on sale in the Fair. Once the business began at the Fair the action continues. Committed with People not Borders, I keep an eye on Twitter. Maybe the London Assembly will ban it in 2019? Sian Berry for the Green Party has already tried, prompting support from Sadiq Khan, but sadly the Labour team withheld theirs. The police can be terrifying, intimidating and violent, but also considerate and as you report sometimes even supportive of the cause. I have never participated in anything like this, but tend to be an armchair activist and Quaker hearted, so I feel I do something if only small. That’s why I thanked you because I really feel it. Gratitude that people like you are willing to go the extra mile and be there showing the world a better way. Your report sounds balanced but seemed full of menace and the aggressive bullying of the arms industry. What a disgrace it is. I’m glad I’m not the only one who feels like this. Maybe one day I’ll attend a protest and make a difference with my presence, but in the meantime know you have moral and prayer support from a member of the world community of people who are against this corrupt and unsustainable system. I’ve said it before Sue – but it wasn’t enough – I’ve read your words about the action you and others have taken – so tearfully I’m thanking you again. Thank you so much for this blog and for having the courage and strength needed to act. It is an inspiration that so many people are taking the arms trade and all the killing, displacement, injuries and terror seriously enough to try to stop it. All I can do is post about it but I hold you and all the otners in the light. Thank you so much for posting this. I really wish I had been there in more than spirit – next time I need to organise myself. There is always something immensely powerful about the quiet dignity of a meeting for worship held in the face of the mayhem and accoutrements of warmongering; the poignancy of die-ins wrenches the heart and the strength of commitment needed for the lock-ons strengthens resolve – all together these are thought-provoking acts of resistance that should challenge us all. Well done to you and Leslie for taking part in this, it can’t have been easy for lots of reasons, and thank you for reporting it so vividly. When will the world come to its senses?